In the last trek we took, I wrote about two seminal papers that describe taste coding in gustatory cortex. Today I'm going to cover a followup paper which described satiety's effects on gustatory coding. The neural systems involved in satiety, food intake, and body weight are incredibly intricate. First, there are endocrine responses: after food intake, leptin and insulin are released, blood sugar increases, and cannabinoid levels drop. Then, as you get hungry again, leptin, insulin, and blood glucose levels drop while endocannabinoid increases. These endocrine molecules bind to a variety of receptors on the tongue, and throughout the brain, including the hypothalamus. On the tongue, leptin receptors are expressed on sweet taste bud cells, and leptin binding causes a decrease in firing, presumably decreasing perceived sweetness. In contrast, cannabinoid receptors on taste bud cells can sensitize the taste response, increasing perceived sweetness. The other well described pathway for endocrine signaling is via the hypothalamus. I'll probably delve into this later, but in brief, the hypothalamus has multiple cell populations which express endocrine receptors, and can directly regulate feeding behaviour. For example, Aponte and Sternson recently showed that if you stimulate AGRP-expressing neurons in the hypothalamus, you can induce feeding behaviour; while stimulation of POMC-expressing neurons over 24h reduces food intake. Given all these ways that satiety can be regulated, what happens in gustatory cortex? To see how satiety influences the CNS, you first need to establish a metric for satiety. de Araujo and colleagues chronically implanted rats with electrodes, and then gave them limited access to a sucrose solution. The sucrose was behind a gate that would only stay open for five seconds after a lick. Two seconds after closing, the gate would reopen, allowing the rat to lick again. They then measured the inter-trial-interval (ITI) to quantify how motivated the rats were to get some sugar (panel A). 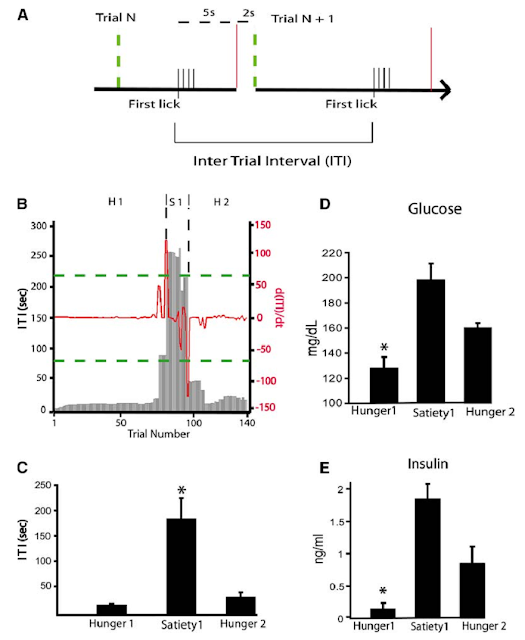 ITI reflects mouse satiety. A. Schematic of licking paradigm, and ITI definition. B. Example ITI for a rat going through hunger-satiety-hunger cycle. C. Population ITI. D. Measured blood glucose in these three phases. E. Measured insulin in the three phases. From de Araujo et al, 2006. In 16/19 animals they found distinct hunger and satiety phases, with ITIs of 18s during hunger1, 180s during satiety, and 35s during "hunger2." On Saturday, I wrote a mini-review on mouse licking, and showed that mice lick in bouts with a regular frequency. Here they also analyzed the microstructure of the licking bouts during hunger and satiety, and found the rats licked at ~6.5 Hz in both phases. Once they categorized well-defined hunger and satiety phases, they then characterized the neural response in four brain areas: orbitofrontal cortex (OFC), gustatory cortex (INS; insular cortex), the lateral hypothalamus (LH), and the amygdala (AM). As you may remember from last time, 30-40% of neurons in gustatory cortex encode taste information; I'm not well read on taste responses in other areas, but I think the percentage is similar. Since they are applying a single tastant, sucrose, one might expect the percentage to be lower here. Of the 625 neurons recorded in all the areas, they found 101 (16%) were licking related, while 152 (24%) responded to taste delivery. 179 (29%) neurons had firing changes related to satiety, but none of these were licking-related cells (panel F). Of these, most (104/179) responded simply by changing their baseline firing rate (panels D & E). For the other 75, their responses to sucrose were altered, with both increases and decreases in firing (panel A-C). Satiety-related responses were found in all four brain areas measured, but some had more responsive neurons than others. (LH > AM > INS > OFC). Examples of cells modulated by satiety. Event rasters are shown above peri-event time histograms. Satiety border shown as dashed blue line. A. This cell lost its sucrose response during satiety. B. This cell lost its anticipatory response. C. This cell gained an anticipatory response. D&E. Changes in baseline firing rate. F. Licking related neurons do not change firing. So far I have described the single cell response, but what about the population response? They looked at this by calculating the mean population firing rate, and found that for 12/19 sessions, mean firing rate decreased during satiety (panel A, below). However, this seems fairly dirty, given that they were able to calculate individual cells' changes in firing rate. They continued this analysis for the next two figures, looking at the population's performance vs individual cells, but to be honest, I don't find it compelling. Population firing during satiety. A. The population firing rate decreases during satiety. B. ITI showing satiety. C-E. Example cells from the population. Only cell E is bimodal. I have a few issues with this paper. First, the temporal analysis is rather shallow: when they characterized cells responsiveness, they simply binned the 500ms before and after a lick. However, five years earlier, they showed that taste responses could have complex temporal profiles, including periods of inhibition and excitation in the same response. Second, I wish they had used more than one tastant, given that there are leptin receptors on sucrose taste bud cells. Using other tastants would help differentiate between endocrine effects on the tongue versus effects via the hypothalamus or other areas. Finally, I would have liked to have seen a more sophisticated population analysis, even just looking at cross-correlation within ensembles. Given those caveats, there are a lot of interesting results. First, there is the most common modulation, changes in baseline firing rate. 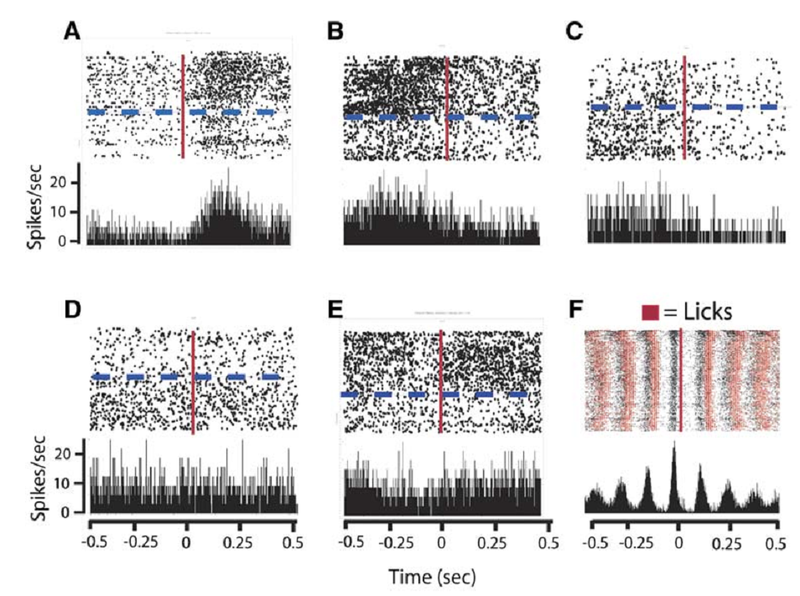 This could influence coding in a few different ways, changing the gain or dynamic range of firing, or changing the potential for synchrony between neurons. That there are more modulations of baseline firing than taste responses seems significant. 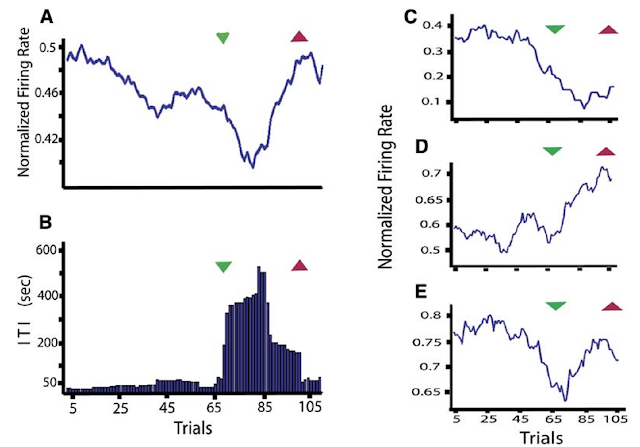 Second, the changes in firing rates of these neurons are quite long (see panels C&D in the last figure), and can continue beyond the end of satiated behaviour. Satiety is a long-term process, changing gradually over hours, so it make sense that neurons' behaviour would also be long term. Perhaps mice's perception of hunger and satiety are faster given their metabolism. Finally, it was interesting to see there were satiety changes in all areas (it would have been nice to see a table with a complete breakdown). The changes in hypothalamus make sense given its involvement in feeding, and orbitofrontal cortex makes sense given its executive function. But there were also changes in the amygdala and gustatory cortex. This could be due to common processes influencing all areas (e.g. reduction in taste receptor sensitivity), or could simply be indicative of how complicated body weight and food intake regulation is.